At 1080p we can see that this patch delivers lower performance across the board, setting aside rumours that this patch only affected Nvidia hardware. Those who say that this was a Nvidia performance fixing patch are lying, AMD's Polaris-based RX 480 is clearly affected as well. This is why conclusive testing like this is necessary here, many have reported that this is a "Nvidia Nerfing" patch across the internet. Looking at these graphs it is clear that Prey's shadow rendering issues affected modern GPU architectures like Polaris and Pascal than their older GCN and Maxwell counterparts. Here we see the R9 Fury X and GTX 980 Ti lose less than 5FPS while modern GPUs like the GTX 1060 and RX 480 lose at least 10FPS on their minimum framerates. 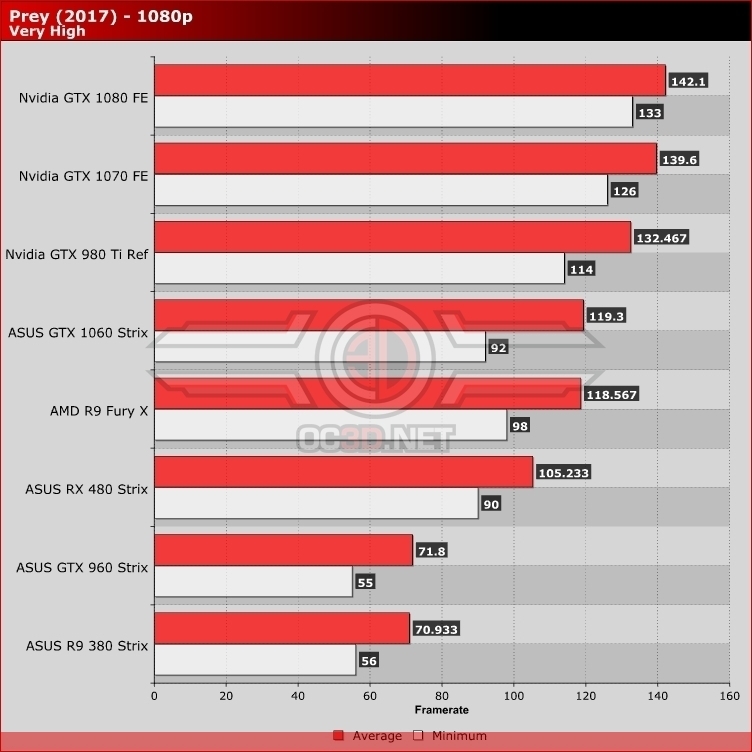 Now Pascal GPUs no longer outperform their Pascal-based performance competitors and AMD's R9 Fury X now easily outperforms Nvidia's GTX 1060 and RX 480, changing the very order of our performance graph.